Analyn's sixth and seventh items on the list are Jet Cosmic Bracelet & paired also with Jet Cosmic semi dangling earrings. The bracelet is a combination of 12mm Swarovski Cosmic Crystals and 8mm Helix Swarovski Crystal AB embellished with 14k gold filled 7mm corrugated ball spacer. 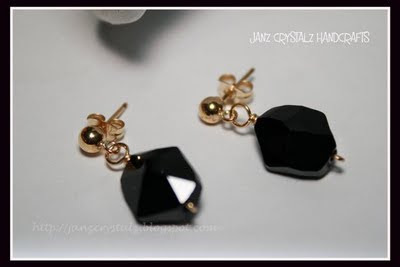 For the earrings I used the same size of swarovski crystals and attached it on a stud danglings. As usual leave some notes of you want the same items.